Dernière réservation il y a 9 heures | 6 voyageurs consultent actuellement cet établissement. Vous souhaitez poser une question à l'établissement U-Sabai Park Resort ? L'emplacement de choix du U-Sabai Park Resort dans le quartier des sites touristiques, culturel, des affaires de Nakhon Ratchasima, en fait un établissement propice à la détente, loin du travail. De là, les clients peuvent facilement se déplacer et profiter de tous les avantages offerts par cette ville dynamique. Avec les principaux sites de la ville, dont Klang Villa, Stade municipal, Wat Sala Loi, à proximité de l'établissement, les clients vont adorer cet emplacement. Le U-Sabai Park Resort offre un service impeccable et tous les équipements nécessaires au bien-être des voyageurs fourbus. Pour le confort de ses clients, cet établissement propose WiFi gratuit dans toutes les chambres, sécurité 24h/24, WiFi dans les espaces communs, parking, service en chambre. Les clients peuvent faire leur choix parmi 41 chambres qui respirent toutes la paix et l'harmonie la plus totale. Les jardin de l'établissement sont absolument parfaits pour se détendre après une longue journée. Le U-Sabai Park Resort est un incontournable pour ceux qui cherchent un hôtel de qualité à Nakhon Ratchasima. L'âge minimum des hôtes est : 3 ans. Staff very nice, you can enjoy breakfast in different things. Nice modern Hotel just outside of town in a quiet area ( car or bike required).Rooms are modern and very clean,plenty of drawers and storage space,beds are not too hard and reasonably comfortable, nice balcony to relax and have a drink.Hotel has a restaurant open from 7.00am,free coffee/tea/ cold cordial and snacks in foyer... just help yourself anytime of the day.Staff are very helpful and friendly. Coffee shop on premises. This is a 4 storey Hotel,and there is no elevator... so book lower floors if you are adverse to climbing stairs. Overall I recommend this Hotel,spent a relaxing 3 days there November 2017. Friendliness and helpfulness of all staff,good spacious modern rooms with lots of storage space and a balcony. Spent 5 days here in March 2015 was not disappointed,room was spacious and modern (Hotel only 2 years old),large comfortable king size bed,huge amount of storage space for clothes and other gear,good clean bathroom,fridge and balcony.Free tea/coffee/fruit juice all day downstairs (help yourself)restaurant with limited amount of meals...but good and plentiful,good coffee shop.Hotel set in a quiet residential area,parking is available.. will need car as it is about 5-10 mins drive to centre of town.Be warned,this is a 4 floor building without an elevator,so if climbing stairs is not your go request a ground floor or 1st floor room.This property does not have a pool. The hotel is quite difficult to access because it is not located on the main road. It is quite new and very clean. It's quiet and pleasant place as surrounded by rural village. However, it is not far from city center (approx. 5 Km.). Rooms are big and comfortable. There is no elevator at this hotel so you should get fit if you stay on the third floor. The hotel is a little way out of town so it helps to have a car. But the hotel itself is modern with very clean large rooms, including a flat screen TV and good free wi-fi. It is very good value for anyone visiting Korat. The staff are helpful and friendly. The only down side is no lift so you have to walk upstairs. I would certainly recommend it. Lovely fishy and waterfall right in front of the hotel, the room is big but the mattress is to hard for me . Staff r friendly and helpful. Price is very cheap but hotel is pretty good. Parking area is large enough for all customer, room is clean; facility looks good; staff are nice but this times I booked the room with full paid via agoda but they missing to booked me a room. I've to waiting them to solve this problem around half hour. A bit disappoint. We are expats residing in Thailand for the past 5 years. We were on a family holiday and decided to stay in Nakhon Ratchasima for a night at U-Sabai Resort. We enjoyed the city & U-Sabai so much much we ended staying for 3 nights. The hotel is located a few Km's out of town but we had our car so that was no problem. 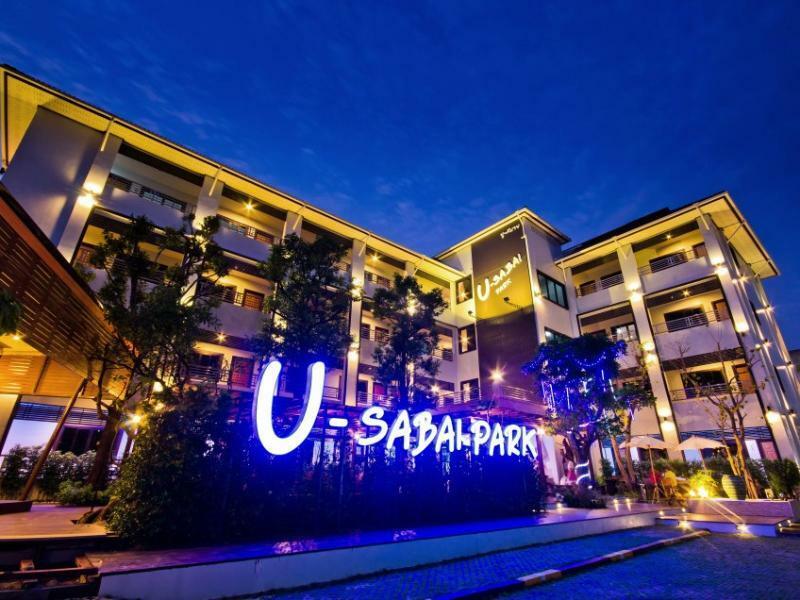 The U-Sabai hotel is new & clean! The staff were amazing & couldn't do enough to help us. There is a great restaurant downstairs. At the time of our visit, in October 2016, the main shopping precinct was "The Mall" downtown about 8Km's from the U-Sabai. In September 2017 the "Central Plaza" mall will open and it is located only about 2Km's from the U-Sabai Resort. We can highly recommend this hotel!! I have stayed at U-Sabai Park on many occasions over the past 5 years because it is the best accommodation which is close to where my wife's family live. The rooms are spacious, air-con is efficient and the staff are very polite and helpful. Beds are a bit hard, but that is the way rural Thais like them. I was in Korat (NR) to meet some folks, and after coming out of Bangkok, I really enjoyed being a little out of the fray. This hotel has almost a country feel, though the drive into the city center is only 5 - 10 minutes or so. If you need a cab into town, call at least 30 minutes ahead though, because taxis aren't whizzing by. Front desk will arrange one on request, of course. Staff was super friendly and helpful. U-Sabai? Yes, me sabai.